Thanksgiving is all about one thing – the turkey! 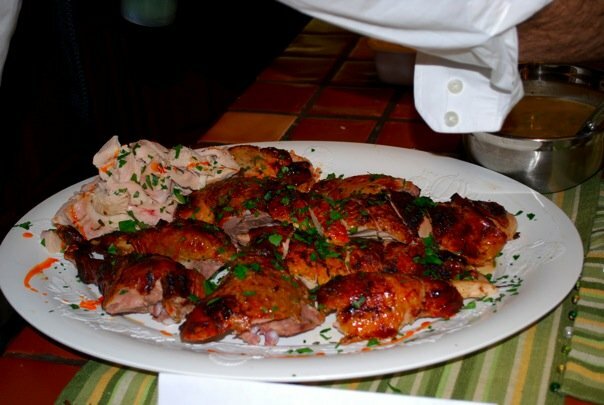 We eat it all year on sandwiches, but rarely do we cook the whole bird. Thanksgiving is the one time of year where everyone pulls out all the stops to make a delicious bird. Now, there are 101 ways to cook a turkey, most of them having merit. There are a lot of different size turkeys one can buy. To brine, or not to brine? Roast or fry? Fresh or frozen? Regular or heritage? Look, there are a lot of questions one has to deal with to select the perfect bird. I’ll make it really simple by answering all those questions for you – follow this recipe and this technique and you will have one deliciously juicy and crispy skinned bird. What sized bird should I buy? 12-14 pounds is what I buy. It’ll feed everyone and give you enough leftovers. It’s also the perfect size to roast whole. I think if you get a bigger bird, you have to break it down into white/dark meat before you even start. Fresh or frozen? I buy fresh. I buy it 2 days before Thanksgiving by reserving one at the store. You can certainly buy frozen, but transfer it to your fridge 3 days before (Monday) so it defrosts by Tuesday and you can go along brining. Regular, organic, or heritage? I buy an organic turkey. It’s only $25-$30 and it’s really tasty. I’ve never had a heritage turkey, but I know they are quite expensive (like $100 or more). If I ever save up the money, I may do it because of my cooking philosophy. But for now, I stick with organic – it’s raised well and it’s about the same price as a regular turkey, give or take a few bucks. Brine or no brine? I brine because I think it’s a vehicle to introduce a lot of flavor into the bird. I also have a few secrets in my brine, that ensure the bird achieves that beautiful golden color. Allright, now that we got that out of the way. Here’s what we are going to do: I cook the bird in 4 steps: (1) The brine (2) the flavoring (3) the roasting (4) the carving. Follow along, here we go! On Tuesday night, I make the brine. I let it cool overnight. On Wednesday morning, I put the bird in the brine. On Thursday morning, I take the bird out of the brine, pat it really dry, and then roast it. First, get the biggest stockpot you have and bring the vegetable stock up to a boil. Add the molasses, honey, salt, black pepper, allspice, garlic, onion, jalapeños, thyme, rosemary, sage, and lemons to the stock. Let boil for 5-6 minutes until all the salt is dissolved. Turn off the heat. Add the apple cider and the ice water. Stir to combine everything. Let this sit overnight until it is completely cool. Grab your 12-14 lb turkey and submerge it completely in the brine, breast side down. If you need more liquid to cover, just add some cold tap water. Let the turkey sit in the brine for 24 hours. Now the brining is done, your bird will be nice and moist. While your bird is brining, make this compound butter that will really help elevate the flavor of the turkey. You could make this today, or the day before and it’ll be awesome. If you have some leftover, spread it on some rolls – it’s amazing! Preheat your broiler. Roast the chiles until they are completely blackened on all sides. Take them out of the oven, put them in a bowl, and cover with plastic wrap. Once cool, take off the black skin to reveal the beautiful red flesh of the pepper. Remove the seeds and put the chiles in the bowl of a food processor. Add the garlic, lemon, and sage. Pulse to chop the peppers and combine all the ingredients. Add the butter and continue to pulse until everything is incorporated. Season the butter with salt and pepper. Roll it in plastic and keep in the fridge, overnight. 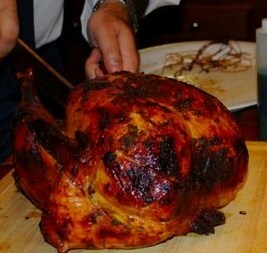 Now that the bird is brined, and you got the butter, it’s time to make that bird! Remove the turkey from the brine. Pat it dry with paper towels and remove any bits of herbs/spices. When the bird is completely dry, take your finger and put it between the skin and meat of the breast. Put some of the butter there underneath the skin. Then take the butter and put it all around the bird, getting the wings, thighs, and drumsticks. Now, stuff the cavity. Season it with salt and pepper. Add the onions, lemon, herbs, and garlic head and stuff it all inside. Get some kitchen twine and tie the legs together. Put the turkey in a roasting pan. Get your trusty probe thermometer and insert the probe into the thickest part of the thigh. Set the temperature to 155 degrees. You want the temperature to be between 161-165. So once we remove it, the bird will continue to cook and carryover will take us into the perfect range. If we take it out at 165, it’ll cook to 170-175 and become dry. Let the turkey cook at 450 degrees for 30-35 minutes. At that point, rotate the turkey and drop the temperature to 350 degrees. Let it continue to cook, rotating the turkey every 30 minutes, until you’ve reached the desired temperature. *NOTE: I do not baste the turkey for three main reasons. One, we’ve already brined it so it’ll be moist. Two, we have a probe thermometer which ensures it’ll cook to 161 degrees. At that temperature, turkey is moist whether you brine it or not. Trust the tools. Lastly, basting moistens your skin, so it’s not as crispy as it should be. Settled. Take the turkey out of the oven and let it rest for 15 minutes. Do not cover it in foil, as that will cause steam making your skin soft instead of crispy. Pull the probe out and carve up the turkey. I showed everyone the turkey at the table, and then went back in the kitchen to carve it up before serving. Not only did everyone get to see it, but I got to snack on all the scraps while everyone else was waiting! I wish I had a cool diagram to show you guys. But I start by separating the legs from the breast/wings. Make an incision on the legs. Then use your hands and pull down until you hear the thigh joint snap. Cut through the joint and you will have a leg quarter. Cut through the joint that connects the leg and thigh. The key here is if you hit a bone, don’t try to cut through it. Find the joint, and your carving job will be neat and proper. I then cut the wings off. For the breast, I first cut on either side of the breast bone, then cut right under the wishbone. Your breast will come off with a few long strokes. I then slice it against the grain in thick slices, so everyone gets a good piece of crispy skin. For you visual learners, I have some guides that I found online! To carve, check out this lovely illustration guide! Or, you can check out this video of Bobby Flay carving up a bird. 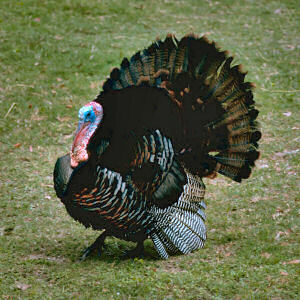 Here is what my bird looked like last year. It was my first time carving, so that pound of meat on the side is what I picked at after I carved. I garnished with just some red chile oil and parsley. None of that other decorative stuff (fruit and acorns?). There you have it – the perfect Thanksgiving roast turkey. If you have any questions, feel free to leave a comment and I’ll answer them for you! Love your recipes! Could this work on a roasting chicken? I am not cooking thanksgiving dinner but would like to try this recipe. Thanks! Certainly you could, but I would do 25% of the recipe. In other words, your brine should be 1 gallon total, since a chicken (usually 3-4 lbs) is 25% of the turkey weight.